Several weeks ago Clara and her family were in Round Rock and decided to try Promise Pizza. A new restaurant featuring gluten-free options is always exciting for us. A not-very-happy Clara reported back and brought me a menu. After reviewing the options and calculating the cost of a simple pizza dinner for three they chose to eat at another restaurant. It seems that there is a $4.50 up-charge just for the gluten-free crust. We are pretty much accustomed to $2.00 or even $2.50 additional for gluten-free but $4.50 seemed excessive. The gluten-free pizza only comes in a 10” medium. So this hungry family of three would have had to order two pizzas. For crust, sauce and basic cheese without additional toppings or beverages they were looking at $22.00 plus tax. When one or two people order a medium pizza it probably works out OK price-wise. But for three people or anyone on a tight budget this is not a practical choice. A lunch special (with a personal size pizza) would not be a gluten-free possibility. Well, one thing for sure was that I was still cooking and eating. But there were so many other things going on that even though I was writing and making notes there was nothing actually posted. It made me feel like a bad blogger! Gardening; in this part of Texas if you don’t get plants in the ground by June 1 you may as well not bother. And even then many of them won’t make it. We had so much rain this Spring that many of our xeriscape plants produced ‘volunteers’ that I wanted to move to new locations in the yard. It was a juggling act between rain soaked ground and being sick from the copious amounts of pollen and mold allergens produced by all the overgrown plants. So on occasion when it was dry enough, cool enough, and the allergies were temporarily suppressed I would run outside to dig and plant. And then be sick again from being out in the middle of it all. So far three Purple Sage plants have new locations as does a baby fig tree and a Sago Palm. My favorite gardening book is Gardening Success with Difficult Soils by Scott Ogden. ‘Difficult’ is a very kind way to describe our dirt . . . .
Ray, my paternal first cousin had a birthday. Attempting to arrange a visit to take him to lunch and bring him a pan of brownies turned into a circus driven by doctors’ appointments due to his battles with allergies and inconveniences of age. He has written a novel based on one of our East Prussian ancestors, Four Flags, which is on Amazon and I am in the process of editing his next book, Broken Star, which is set in Central Texas during World War II. He is so much fun to chat with. His black cat Velvet divides her time between us, we delve into the mysteries of his computer and then take yet another tour of the incredible variety of plants in his yard. Each visit sends me home with the start of yet another hardy native Texas or adapted plant. Our Grandmother Mina taught us both to care about such things. Then Rita sent me a link to a blog where she found with an intriguing recipe for Golden Flax Bread on Anima Healing Arts by Kiva Rose posted in May of 2008 (the internet is such an amazing library!). The bread is super simple to mix up with a whisk or spoon, no mixer or kneading required and the ‘flour’ is a blend of ground flax meal and nut meal. I have baked three batches to date varying the ingredients slightly. I took some with me on our trip to Fort Worth last weekend where I enjoyed the Mother’s Day treat planned by daughter Teresa. Teresa has come to appreciate the art of Georgia O’Keefe as do I. And with the current exhibit at the National Cowgirl Museum and Hall of Fame in Fort Worth it seemed like the perfect way for the two of us to spend an afternoon. The Georgia O’Keeffe and the Far Away: Nature and Image exhibit features a number of sketches and paintings from the section of New Mexico that held a special fascination for the artist. The geographical area is presented in the photographs by several individuals (including the iconic Ansel Adams) who spent time camping there with her. Between the video of the artist in that location, the narrative, the sketches, the paintings, a diorama of her camping equipment and clothing you are immersed in the feel of that landscape which is what she captured in her art. My #1 Son (a family joke – his being the only son), Jorge (who lives in California) is battling a shigella intestinal infection that had him in the hospital for more than a week and his far-flung family stressed out. No one is more capable of taking care of him than his partner Rick, an incredibly capable and compassionate man. During this time I still received a wonderful bouquet for Mother’s Day. And as icing-on-the-figurative-cake, his alma mater chose to honor him in Spotlight on Alumni. Rita, knowing my deep affection for all manner of fruit but especially tender, juicy pears again sent me a shipment of those legendary Harry and David Royal Riviera® Pears for Mother’s Day. The boxes are taking up two shelves in the fridge but I am slurping my way through them at a very leisurely pace. Pears, when chilled, stay nice for a very long time and I intend to thoroughly enjoy them. Late one evening with the recipe book, The Cake Mix Doctor, coming due at the library I attempted to pull together a gluten-free cake mix and merge it with instructions to create a Tiramisu Cake. The technique, if successful, would have opened up an easy, incredible world of cake-based desserts. The resulting experiment was way too sweet – can you believe that I would ever say that? It was pretty good when initially served but more than a few bites is way too much. The leftovers turned into a pan of really dense and gummy glop overnight. What Don and I learned was that enough batter to fill a mini-donut pan makes just the perfect size dessert cakes. When those are drizzled with the coffee-flavored syrup, topped with a teaspoon of whipped ‘cream’ and sprinkled with cinnamon-sugar they are just the right serving size. Then instead of a large, soggy, cream-laden cake the mini-cakes are frozen until the momen they are needed – that concept seems workable. I’ll come back to it in a month or so. Baking is going to slow down now that the weather is warming up. Granddaughter Megan has returned home for the summer break and I am back working in The Pantry at The Caring Place on Friday afternoons with Ann filling food orders that have been approved in the Client Services area. It was very exciting to find that there is now a ‘specialty food needs’ section being developed. So far it includes sugar-free for diabetics and nutritional supplements for people on dialysis or in rehab. Gluten-free and low-calorie needs are being considered. The support for the mission of this organization within the Georgetown community is inspiring. Nowhere is there a finer staff and volunteers – these people are tops. Then out of nowhere last week came an email asking for immediate assistance with taping a segment on our local channel 79. Everyone else in our organization was out of town or unavailable. So on 2 days notice I wrote a script using the approved outline – it was for a contest for the best neighborhood and I still don’t know what the prize is. The producers wanted 3-4 people per neighborhood for the show. I met my eventual co-anchor for the first time 30 minutes before taping (we have >500 residents in our neighborhood and I don’t know all of them) and we sorted out which parts we would read. There was no rehearsal – our first time through was live. I was never good at public speaking and the whole scenario freaked me out. And lest I forget (not likely), we are preparing the house to have all of the carpeting ripped out and replaced by ceramic tile. Hard surface floors are much more allergy-friendly than carpet. That means packing half of everything we own into boxes. It is like moving only you don’t. This month’s SOS Kitchen Challenge ingredient is spinach. 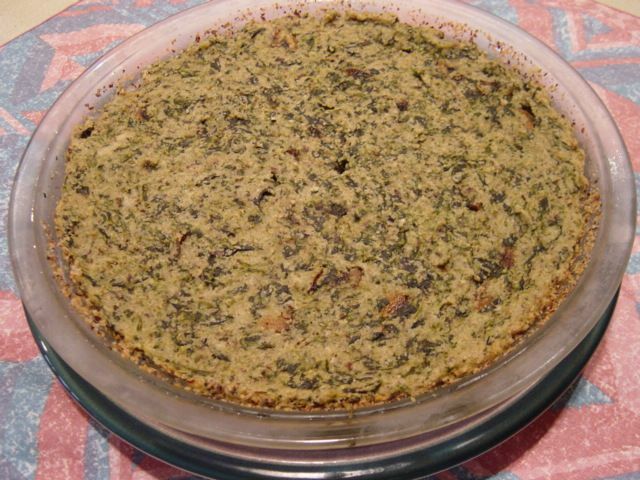 The choice of spinach as the challenge’s ingredient really kick started my efforts to makeover my long time favorite recipe for Spinach Mushroom Pie. There is nothing like a challenge for motivation – thank you Ricki and Kim! Be sure to check out their sites for lots of other healthy recipe submissions by other bloggers. There was such wonderful feedback from my taste-testers on the texture of the Sweet Potato Pie ‘Cheesecake’ at the end of March that I printed out both of my recipes and started splicing. It always helps to have a plan of attack even if you eventually deviate from that plan. The blender and I had another ‘go-round’. And the red spatula lost a few more bits. The red shows up and is easy to pick out of the blended mixture so from now on all of my spatulas are going to be red! The cashews were soaked for well over twenty-four hours. The spinach was leftover from a batch of sautéed fresh spinach with garlic. The mushrooms were fresh. There was cooked quinoa on hand to use somehow in place of ricotta but I wasn’t too sure about how that would work out. And hazelnut meal was ready to stand in for grated Parmesan to provide taste and texture. Whew! That’s a lot of ingredients to bring together. So the first order of business was to prep the mushrooms. Clean, slice, sauté and put them in the mixing bowl with the spinach. Add 1/2 of the quinoa, hazelnut meal, and seasonings. Drain and rinse the cashews, warm in the microwave briefly (so they don’t solidify the coconut oil) and place them in the blender jar. Pulse the blender gently to begin the breakdown process. Add the warm coconut oil and the remainder of the quinoa also slightly warmed – and work the blender pulse control. This is where I had to improvise. The mixture became too thick sort of like super library paste so I warmed a couple of tablespoons of coconut milk (I was out of almond milk) and added it to the mixture. This was better but still way too thick. So in went another two tablespoons of warm coconut milk (how did we ever function without a microwave?). This was still incredibly thick but at least it was manageable. This is where I considered adding more liquid but the spinach and mushroom mixture had its own liquid going so I just dumped and scraped the nut mixture into the spinach mixture and stirred it all together. The pie plate was previously prepped with a coating of hazelnut meal stuck on with coconut oil (far left in the ingredients picture). Next all of the filling was carefully spooned into the ‘crust’, smoothed over, and moved into the 350*F oven where it baked for 45 minutes. I had no clue as to ‘how long’ to bake it – the ‘cheesecake’ had taken an hour. The pie was tested at 30 minutes with a thin knife and returned to the oven for another 15 minutes. After that test I returned the pie to the oven with the heat turned off so that the remainder cooked on residual heat. So it took a full hour like that ‘cheesecake’. Did I mention that the kitchen now smelled deliciously of all the herbs? After removing from the oven (total oven time was 60 minutes) the pie sat on a cooling rack while my guilty conscious drove me out into the yard to pull weeds and cut back the stems on the bloomed-out irises. Plus I was afraid of burning my tongue if I tasted this experiment too soon and all of you know what that is like! Finally it was cool enough to put in the fridge so I could ignore it for a while longer and allow the seasonings to mellow. And it was so worth the wait . . .
Looks Good, Smells Savory, Tastes Yummy! Plan ahead: At least one day before put the cashews to soak and cook enough quinoa so that you will have 1 cup for the pie filling. Store the quinoa in the fridge and the cashews as well if they soak for more than the 24 hours (and that’s OK). Prepare a 9” pie pan by coating it with oil or spray. Sprinkle the 3 tablespoons of hazelnut meal into the pan and then tilt and rotate it to distribute the meal to create a very thin ‘crust’. Do this maneuver over the bowl for mixing the filling so that any spills are saved – set the pan aside. 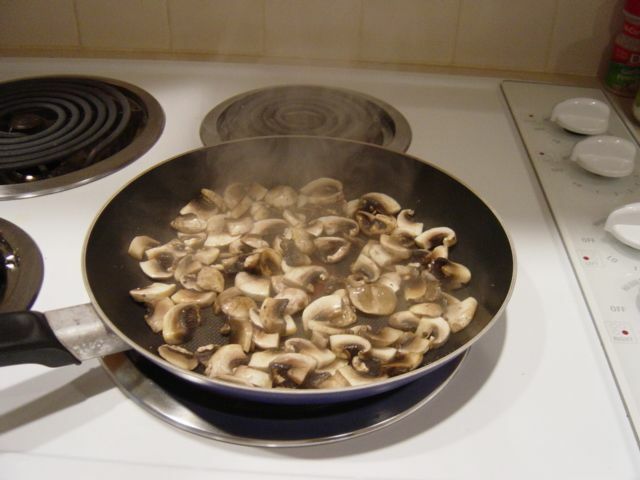 Turn the oven to 350*F.
Put the spinach and mushrooms in your mixing bowl. Add 1/2 cup of quinoa, hazelnut meal, and dried herbs. Stir well to distribute the seasonings. Drain the water from the cashews. If they have been refrigerated then warm them in the microwave for about 30 seconds. Dump them into the blender jar. Add the coconut butter, sea salt, the 1/2 cup warmed quinoa, and 1/4 cup coconut milk. 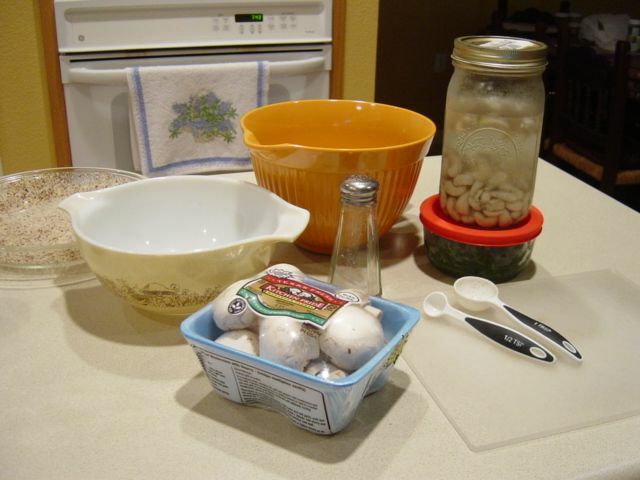 Start the blender and begin to break down the cashews, pulsing and pausing to scrape down the sides as needed. 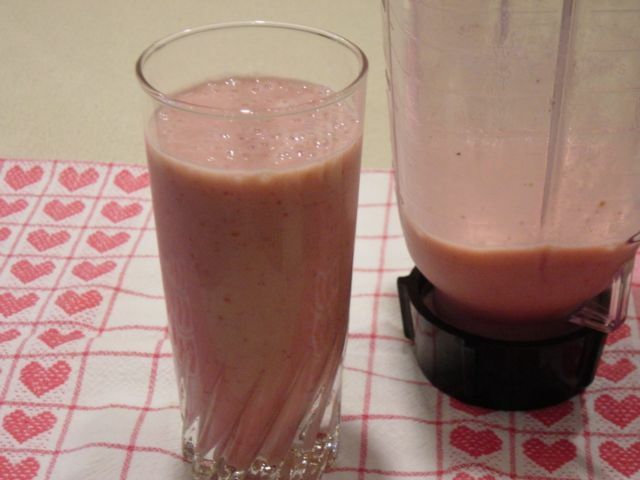 Dial up the blender speed and begin to puree the mixture; again pulsing and pausing to scrape down the sides as needed. Add the remainder of the coconut milk only if you really need it but do not hesitate if you do need it. The worst that can happen is that it takes a few minutes longer to bake. When the blender mixture is perfectly smooth like nut butter then add all of it to the vegetable/herb mixture and stir so that all of the ingredients are evenly distributed. Carefully spoon the mixture into the prepared pie plate and smooth down the top. Transfer the pan to the oven and set the timer for the first test (about 30 minutes). It will not be ready unless you have a really hot oven. Testing is similar to any other baked item – the knife should come out relatively clean. Add another 15 minutes and test again. If it is still not ready then put it back, turn off the heat, and go away for 15-30 minutes. Cool the dish on a rack before cutting into serving portions. This recipe provides 4-8 servings depending on the rest of the meal. I cut it into 8ths so that it lasts more days for breakfasts and snacks! 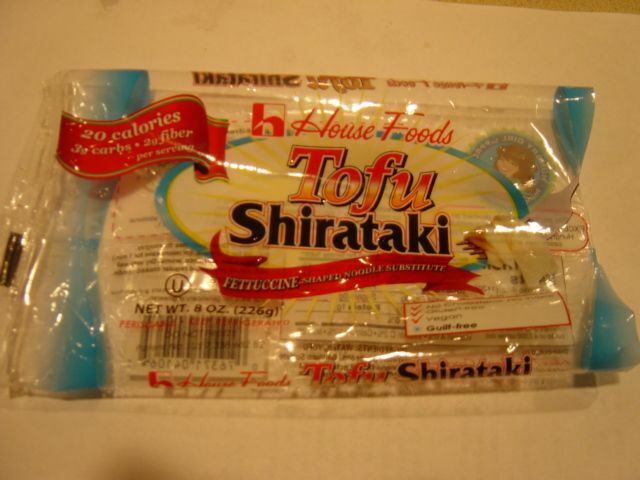 Browsing at the Sprouts Gluten-Free Jubilee there was a package of these noodles, House Foods Tofu Shirataki, in the refrigerated, non-dairy case with the soy and almond products. Sometimes you read about a new product on the internet but it never makes it to a store near you; and you don’t want to spend > $10 just to see if you might like it. This would be in the interesting-but-not-essential category. But here they were and on sale at 8 ounces for $1.11. So in spite of the reviews I had read about the ‘fishy odor’ I dropped a package of them into my shopping cart. Preparation directions specified to drain and rinse the noodles. They did smell a bit like a fish tank but a very clean well-kept fish tank. Then par-boil the noodles, drain them again and then dry them before use to eliminate any trace of odor. I then treated the noodles like any other product that I use with Don’s excellent pasta sauce. I love the classic garlic-butter-Parmesan combo, heavy on the garlic so that is what I did to the noodles before covering them with sauce. These do not have the flat, gummy bite of regular noodles. Did you ever hang around in the kitchen while your mother peeled potatoes – begging for a piece of raw potato? These noodles are quite firm and require definite chewing kind of like a very thin sliver of that raw potato or maybe apple. It might bring back an entirely different memory for you. Or maybe you have never experienced this texture before. Whatever you decide about the texture, the sauce and seasonings cling to the noodles without sliding away so each bite had all of the combined flavors and it was actually quite good. Additionally this product is endorsed by the food blogger Hungry Girl who has made a career out of reporting really-tasty, very-low-calorie, satisfying food to maximize the pleasure of eating. Her philosophy is that if you are smart about it you can eat a lot without gaining weight or sacrificing your appearance and/or health. These fetticcine shaped noodles, made from tofu and yam flour, are a relatively healthy choice. I might buy them again but then maybe not. I have years of loving this sauce on top of all kinds of squash, summer or winter varieties, French-cut green beans, or even a stack of yummy sautéed mushrooms; veggies rock my world. But you may want to give them a try – you never know when you might find your next most-favorite thing! Manufacturers of convenience foods are stepping up their publication of nutrition and allergy information. Even those who produce snack foods are providing in-depth information. I am experiencing a very mixed reaction to this development. Initially I am pleased that industry is taking the gluten issue seriously. And then it hits me; these items were not a choice for me when there was no reassuring stamp that says ‘gluten-free’. So really, do I really want to dive back into a bag of those screaming-yellow, salty, finger-licking, addictive Cheetos again??? Now that I have learned all of these lessons regarding nutrition and monitoring everything that I eat do I want to go there again? These babies sound it’s like open-season: Our LAY’S® STAX® chips (all flavors) are made on gluten free lines, thus all LAY’S® STAX® products are free of gluten. The above products do not contain gluten; however, they are produced on the same line as our products that do contain gluten. Although the lines are washed between batches, a slight residue may remain on the lines. Individuals who are extremely sensitive may be affected.